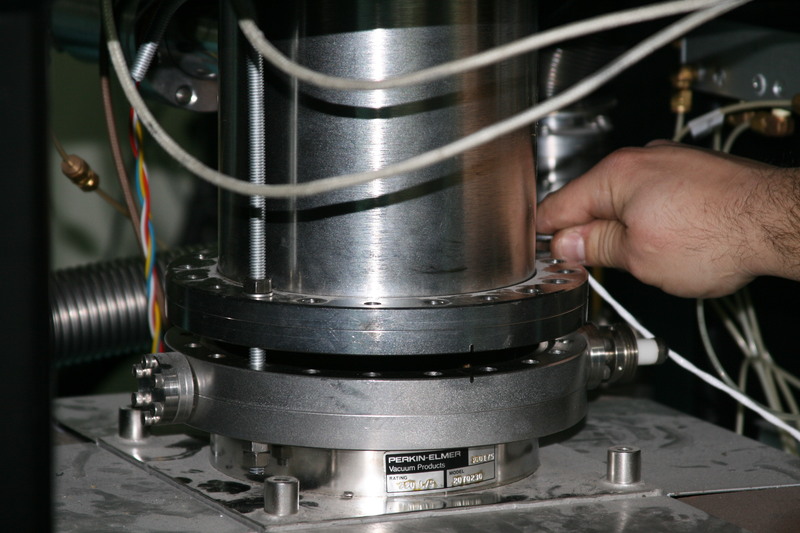 After a number of years it becomes necessary to replace the ion pump elements used on surface analysis instrumentation such as X-ray Photoelectron spectrometers (XPS), Auger (AES), and Secondary Ion Mass spectrometers (SIMS). But what if you can’t afford the cost of new ion pump elements? Depending on how worn out the plates are, you may simply be able to “flip” the plates. This procedure is written for the DI (Differential Ion) pump elements used on most PHI surface analysis and Perkin Elmer vacuum systems. However, it can also be applied to other ion pump elements such as Varian, which are used on many general-purpose vacuum systems. Ion pump elements have three basic components: magnets, an anode, and two cathodes. 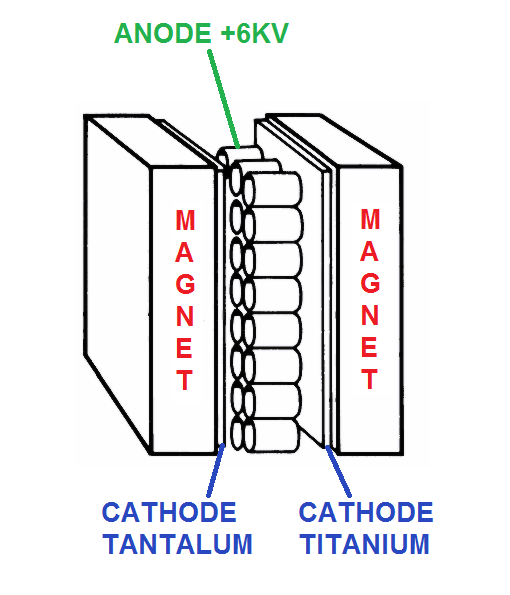 For the DI pumps, one cathode plate is made out of tantalum and the other cathode plate is made out of titanium. Using cathodes made from these two materials provides good pumping stability for both inert and active gases. The size of the pump is determined by the number of elements used. For example, a Perkin-Elmer 120 l/s ion pump has 4 elements and a 220 l/s ion pump has 8 elements. The magnets cause electrons, which are created as part of the ionization process, to spiral in the anode. This in turn increases the probability of a collision with a gas molecule. When an electron collides with a gas molecule, the gas becomes ionized and the molecule is accelerated into a cathode. Over time, the cathodes become sputtered away and the ceramics that isolate the anode become coated and conductive. Also, flakes can form and accumulate, which can cause arcing from the anode to ground. As a result, the pump elements’ performance is greatly reduced and the elements need to be removed and inspected. Usually, the pump elements need to be replaced. However, if the plates are not sputtered all the way through, it is possible to simply “flip” the plates, clean the anode, and replace the anode-isolation ceramics. Functionally, the ion pumps will be good as new. They will not last as long as new ion pump elements because the plates will not be as thick as new elements. You can, though, often get an extra 2-to-5 years of usage from the elements depending on your base vacuum, gas load, etc. 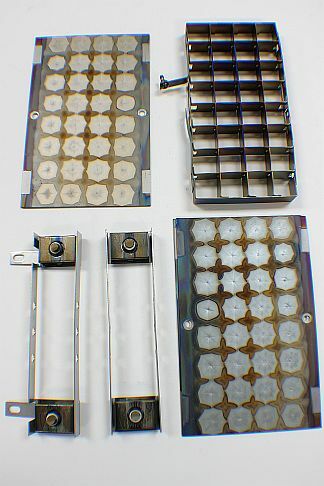 In the image below, you can see the anode, cathodes, and the heavily coated anode-isolation ceramics. 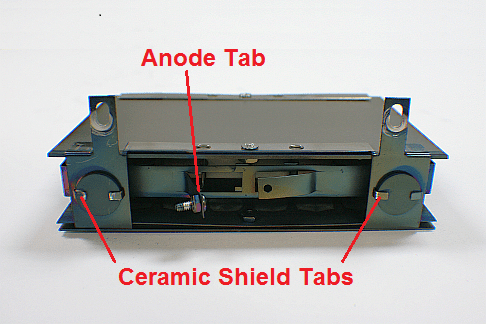 Before you disassemble the elements, make a note of the position of the anode tab. One of the elements usually has the tab on the opposite side from the others. You will reassemble the elements so the tab is in the same location. Wear gloves and use clean tools when disassembling and reassembling the ion pump elements. Use a slotted screwdriver and a 5/16″ open end wrench to remove the screws and nuts that hold the elements together. TIP: Use isopropanol as a lubricant to prevent the nuts from seizing. Use a small flat-tip screwdriver and a pair of pliers to bend the ceramic shield tabs up. Lift each ceramic shield out of its support bracket to remove the anode-isolation ceramics. 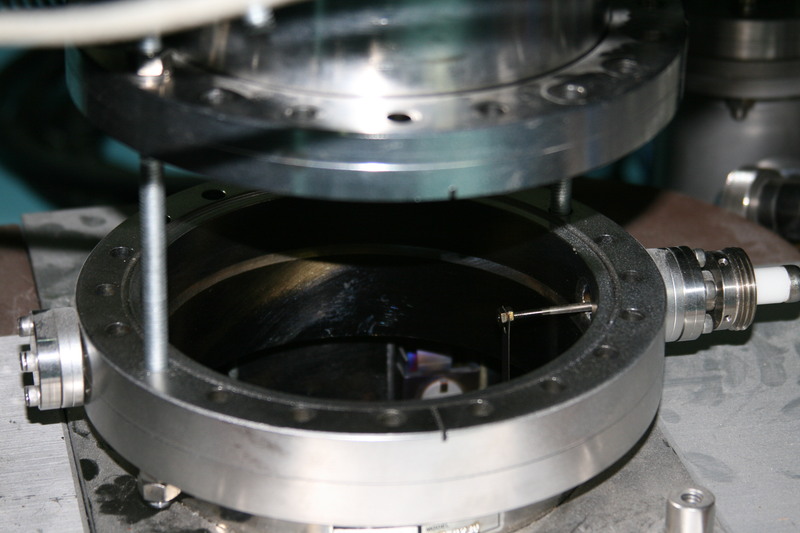 The image below shows the cathode after it has been sputtered. The sputtered areas look like pin holes. 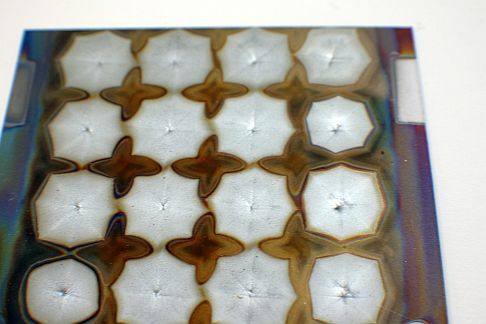 In this example, the sputtering is only about ½ of the way through the plate, which means that there is a lot of material left. As shown in the picture below, we can see that the cathode is not sputtered all the way through when we flip it over; there are no holes on this side of the cathode. Because the center of the sputtered area will most likely not line up perfectly when the plate is flipped, the lifetime of the pump will be extended. 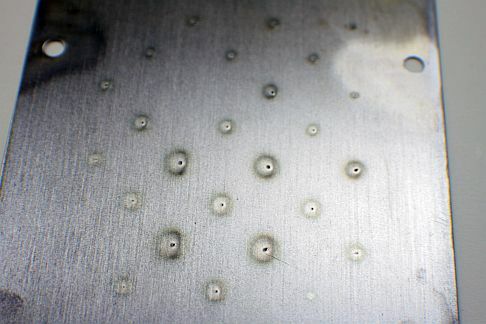 The picture below is an example of a plate that is sputtered all the way through. In this case, the ion pump elements need to be replaced and not rebuilt. 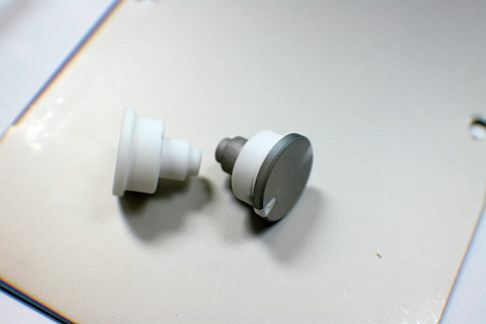 The picture below shows a clean ceramic and a coated ceramic. RBD Instruments provides the new ceramics. Please visit the Parts – Vacuum related section of our website at www.rbdinstruments.com. While wearing gloves, use a clean wire brush to remove any flakes from the plates, anode, support brackets, and ceramic shields. Note that you do not need to remove all of the deposits and discoloration on the parts. Just make sure that whatever remains will not come off easily. The important thing is that the active portion of the plates is now fresh, the ceramics are new, and there are no loose flakes that can cause shorting. Install new ceramics. TIP Use a channel lock pliers to crimp the tabs on the ceramic shields that hold the ceramics in place. Flip the plates so that the fresh side is facing the anode. 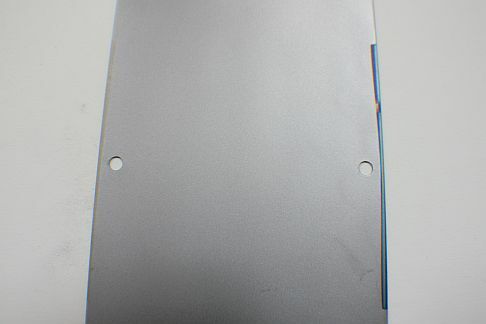 Because the tantalum plate is thinner the titanium plate, most elements will have a thin steel plate on the tantalum side of the cathode. The tantalum plate will be noticeably heavier than the steel plate. Make sure that you put the clean tantalum side towards the anode. 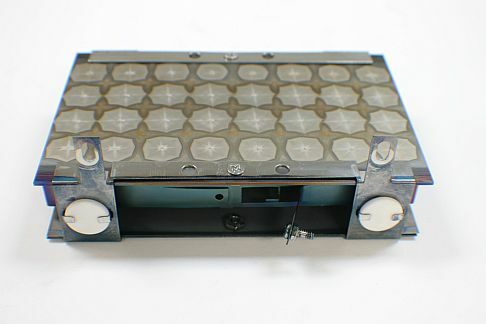 The picture below shows the dirty element after the plates have been flipped and reassembled. It may not look pretty, but it will work as well as a new element. Assemble the plates and support brackets, as shown in the picture above. Make sure that the support brackets are holding the anode snuggly as you tighten the screws and nuts. Before installing your rebuilt or new ion pump elements, use a wire brush and a vacuum cleaner to clean the pump well and remove all flakes that are inside the pump well. You can also wipe the inside of the pump well with a Kim wipe or lint-free cloth and some isopropanol. You want the pump well to be as clean as possible as any remaining flakes can cause shorting in the elements, which would require that you disassemble the ion pump again. If possible, bake your vacuum chamber into the turbo pump for 4 hours. Let the ion pump cool down before you try to start the ion pumps. Removing as much water vapor as possible will make the ion pumps much easier to start. Pump the chamber until you are in low 10-7 or low 10-8 Torr range. With the ion pumps on, bake the chamber again for an additional 8-to-24 hours. This entry was posted in General Optics and Vacuum and tagged ion pump element by Randy. Bookmark the permalink. Hello sir I have a qestion. how is operate Ion pump ? I have turbo pump, rough pump and chamber. I will email you directly as I would need some more information such as what type of ion pump and controller you have. A very thorough description of how to restore an ion pump back to full pumping capacity without having to purchase new titanium/ tantalum plates, which can be expensive. A few months back RBD actually talked me through this process and it worked a treat; so it is indeed a very handy trick to know.